Thousands of people from throughout France attended a rally in Paris against the Macron's fuel tax and increasing poverty of people in France. Hundreds of thousands of people from throughout France on September 24, 2018 protested the Macron government which has imposed fuel and other taxes on the people while real income is going down. In Paris, the protesters were met with massive amounts of tear gas and police repression with over 140 arrests. The government mobilized thousands of police to prevent protesters at Champs-Élysées French police forced protesters from the populist “Yellow Jackets” away from the Élysée Palace. Participants also talked about Marcron and the government's role in pushing privatization and creating an increasing number of poor. French unions did not participate in this mass popular protest which the government claimed was supported by racist and rightwing parties in France. Marchers demanded that Macron leave office. The police used a massive amount of tear gas on the protesters. 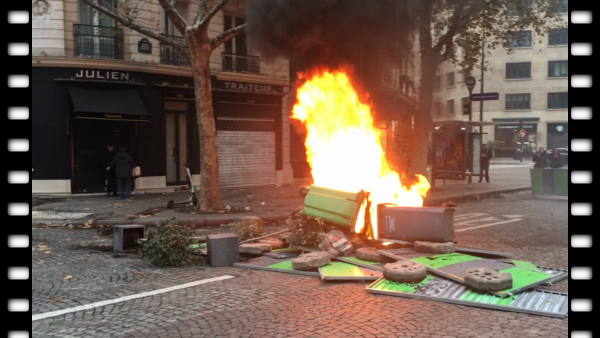 Trash plastic receptacles were set on fire in the streets. The streets were blocked off to prevent protesters from reaching the Champs-Élysées palace.